What's that sound? Don't you hear it? It's the sound of your feet crying out. They hurt. They're scared. They're wet. They're telling you it's time to retire. No, not you! It's time to retire your lackluster work boots. We can hear them trying to convince you to in ... (see full details) (see specifications) #1016166. What's that sound? Don't you hear it? It's the sound of your feet crying out. They hurt. They're scared. They're wet. They're telling you it's time to retire. No, not you! It's time to retire your lackluster work boots. We can hear them trying to convince you to invest in a new pair, too, and we're here to offer you the best options. These KEEN Utility Mt. Vernon Met Guard Steel Toe EH Men's 1016166 Brown Boots are just that. They're waterproof, protective, comfortable, and strong. At work, you need protection made for the type of environmental threats you face on a day to day basis. These KEEN Utility Mt. Vernon waterproof boots come with not only a left and right asymmetrical steel toe cap, but they have an external metatarsal guard as well. The steel toe cap protects your ten toes from drop impact and prolonged pressure, while the metatarsal guard prevents harm from occurring to your metatarsal bones on the top of your foot. The asymmetrical steel toe is designed to be roomier than other safety toe boots. The external metatarsal guard and steel toe qualify these men's brown leather boots to meet the requirements for the safety standard ASTM F2413-11 I/75 C/75 MT75 EH. The EH portion of the rating has nothing to do with the metatarsal guard or steel toe - it means the rubber outsole on this men's steel toe footwear can help keep you guarded around certain electrical hazards. The outsole is also slip- and oil-resistant, and it meets the conditions for the standard ASTM F1677-96 Mark II. The majority of work boots cannot defend you from harm as well as these KEEN Utility boots can because they lack a metatarsal guard, and other work footwear doesn't have a specially-designed steel toe like this pair does. These EH met guard boots are constructed with toughness, which can aid in how well your feet are protected from harm and how long the slip-resistant boots last. The upper is crafted from Nubuck leather. Nubuck leather has been through a sanding process that makes it more resistant to wear yet softer to the touch. Beneath the leather upper is a non-marking rubber outsole made to last through all kinds of work you put them through on a daily basis. The leather upper and rubber sole are the ideal combination for a strong men's footwear. To make sure your feet don't become saturated with unwanted wetness, these KEEN Utility Mt. Vernon met guard boots are waterproof, too. The Nubuck leather upper previously mentioned is water-resistant. Liquid just slides down the slick material. To be certain no water can enter the upper and ruin your day, these waterproof boots are lined with hydrophobic/hydrophilic 2-zone technology. It's great at wicking moisture away to ensure your feet stay dry through every wear. 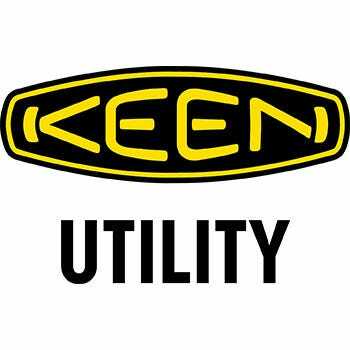 KEEN Utility knows you'll be wearing their Mt. Vernon boots for long periods of time and that you'll be quite active in them, which is why they're made to be incredibly comfortable. They have a polyurethane (PU) midsole and a removable metatomical dual-density footbed. The strength and flexibility of the PU midsole supports the soft, cushiony footbed to make sure that the great feeling is long-lasting. The metatomical footbed design acts as an internal support mechanism capable of providing supreme arch support while cradling your foot's unique contours. For additional stability, a thermoplastic polyurethane shank was included. It distributes pressure evenly across your foot so that certain areas aren't strained as you work. These KEEN Utility oil-resistant steel toe boots don't just come with the soft side of comfort; they're made to energize your feet so they can work tirelessly the whole shift. What's that sound? Do you hear it? It sounds like your feet are begging to wear these KEEN Utility Mt. Vernon Met Guard Men's EH 1016166 Brown Waterproof Boots. You should appease them right away, and get these ordered here at Working Person's Store today. KEEN Utility Boots: Met Guard Men's 1016166 Steel Toe EH Brown Mt. Vernon Boots is being added to your cart.